Craftable Spawners is a mod that allows you to obtain the Mob Spawners blocks in game and use them. The mod is fully SMP compatible and relies on Minecraft Forge. The middle "X" determines spawner type. 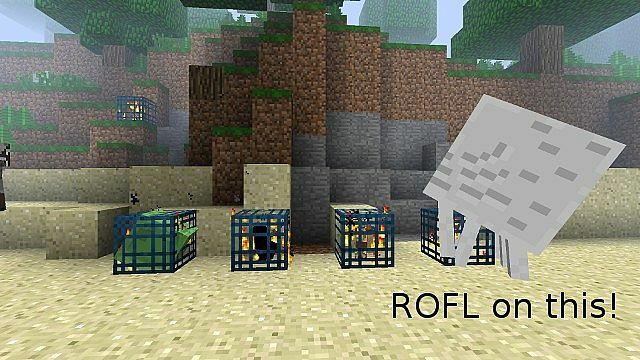 Monster Spawner block (pig spawner) + mob's specific item For example, take the monster spawner, and craft it with string, and you get the spider spawner. The block can be obtained using inv editing, or my Minable Spawners mod. Spawned sheep will have random fur, and this cannot be changed. Slimes need depth and their special chunks. Spawner block was not changed, all other spawner mods will still work. Maps built with this mod don't require it. Built spawners are legit, no new contents was added. What you craft is Spawner Builder item, which can build the real spawners. The skeleton spawner spawns Wither Skeletons in the nether. This mod requires Minecraft Forge. Place this zip file into .minecraft/mods. Anyone is free to make new textures for the mod. I'll feature the best ones! Maybe compatibility with modded mobs? I'd like to craft a piece of cyberware and get cyber zombies to spawn. Is this 1.7.10? If not, can someone point me to a 1.7.10 version? I downloaded the Craftable Spawners, but not realized as I install and put the folder on my server. If I could ever very grateful.